I am painting in oils the abandoned ranches, historic buildings, and old times of the western settlers. Entitled "Ghost Ranches of Montana" the collection of 75 pictures, and growing, are on canvas, old barn wood, and antique metal. They document early home and homestead sites of Montana, as well as the daily lives of the inhabitants, including Native Americans. With the ravages of wind, weather, development, neglect, protection of livestock, and consolidation of farms and ranches, many significant buildings and landmarks are collapsing or being razed. As stark testimonies to the lives dedicated to ranching and farming, others stand silently alongside new structures. I am preserving and chronicling the last of these with a suite of dramatic oils painted in a realistic, detailed style. The paintings show the beauty, strength, and character found in all these hallowed sites and in the lives of their inhabitants. To gather subjects, I travel the State, interview local residents and experts for the histories of the buildings and the people that built and occupied them, and study documents and photographs of the times. 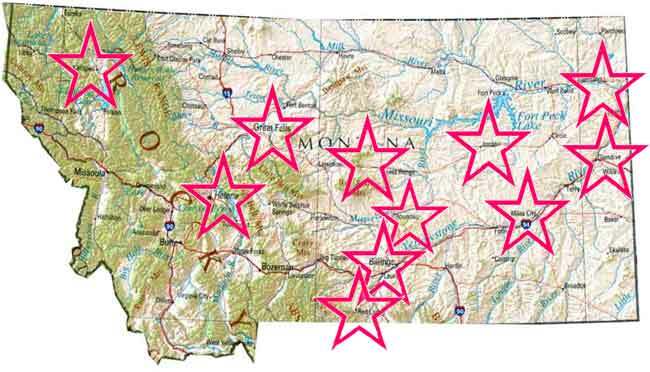 As can be seen on the map below, ranches included represent most parts of the state, including the Crow Reservation near Billings. The paintings on canvas depict buildings, furnishings, and equipment as they appear today, while those on barn wood, done in muted sepia tones to simulate old photographs, depict the people that lived there. The canvases are framed in actual barn wood, hand-crafted by Dallas Teini, a Montana artisan. As I toured these sites I felt the spirits of these courageous pioneers still clinging to the rusting tractors, disintegrating structures, and discarded heirlooms littering the properties. I believe I have caught in oils the life and times of our first western settlers. My seven years of work amounts to the intellectual, artistic preservation of a significant portion of Americana. Christopher Dziadosz of Hammer Galleries in New York City wrote of my barn wood pictures, "All in all these paintings exhibit a level of uniqueness that I have not seen in a long time." "A haunting exhibit," says both the Havre Daily News and the Lewistown News. My show at the Jadite Gallery in New York City was reviewed by Gallery and Studio, June/July/August 2008, which stated, "Stanfel evokes the silent poetry of forsaken places.There's an elegiac quality to the paintings that can sometimes remind one of Andrew Wyeth.As always, Stanfel's treatment of time worn surfaces, her attention to details such as cracks and stains lends these objects a haunting poignancy." The map below shows the areas I have documented. Please click on one of the stars on the map and enter my cyber-museum. I believe you will find yourself transported back to these lost yesteryears that never will return. Through the pictures and lore you will experience life in the "good ole days" from branding and sheep herding to sharp shooting in Buffalo Bill's Wild West Show and meditating in a sweat lodge. Enjoy yourself.